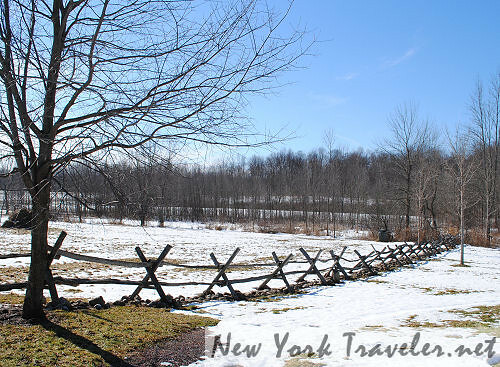 Just south of the small town of Palmyra, in Wayne County, NY, is the small site dedicated to Joseph Smith, founder of the Mormon religion. The site was very barren and foreboding on a blustery February when we visited. 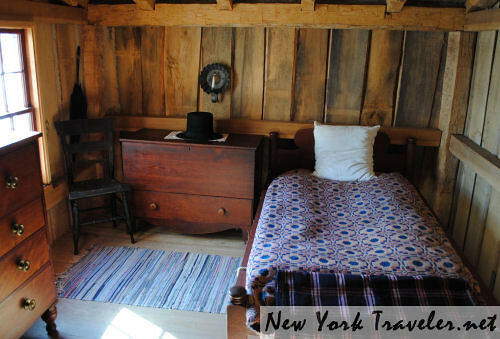 We decided to stop so that I could take a few photos of the reproduction log cabin, a home similar to the original in which Joseph Smith, a teenaged boy, lived with his parents and passel of siblings. As I snapped a few photos, a woman appeared at the visitor’s center. I was surprised to see anyone there! She asked me if I wanted to see inside the cabin. I said “OK,” and two young ladies introduced themselves and escorted me in. 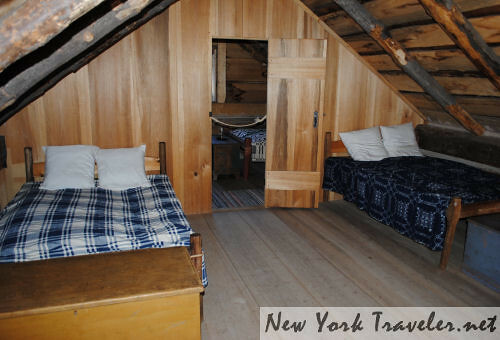 The first thing I noticed was how snug the cabin was from the terrible gusts of wind outdoors. 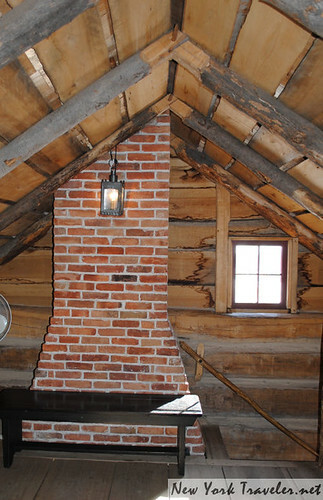 These old cabins may look rickety, but they are actually surprisingly warm and draftless. 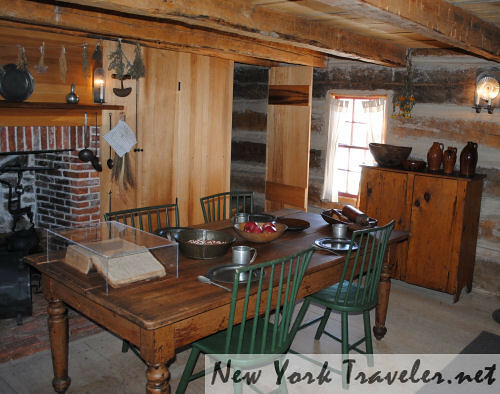 The cabin was obviously decorated to imitate a typical family dwelling in the early 1800s. The young ladies narrated the story of Joseph Smith while I snapped photos. 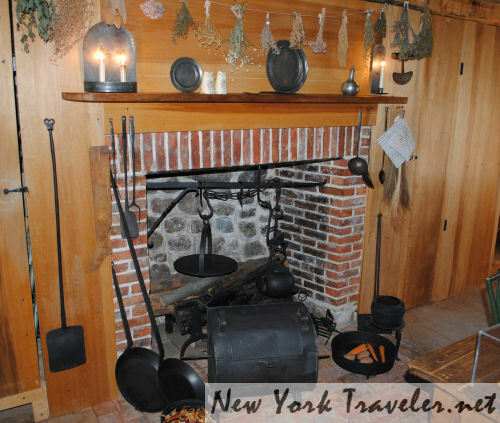 According to the various accounts, young Joseph (Joseph, Jr., as he was named after his father) was about 14 years old (but later Joseph claimed in various accounts he was 15, or 16, or 17, or perhaps 18) when he wandered out into the “Sacred Grove”– the woods behind the cabin. He’d been laboring over what denomination was the “true church” when he claims he saw a vision of God the Father and Jesus Christ. Joseph Smith, Jr., (1805-1844) was born into religious controversy. The religious views of his parents differed as much as those of his grandparents and great-grandparents. Quite a few of his family members had aligned themselves with such systems of thought as Seekerism, universalism, and orthodoxy with a mixture of folk magic, and Indian superstitions. 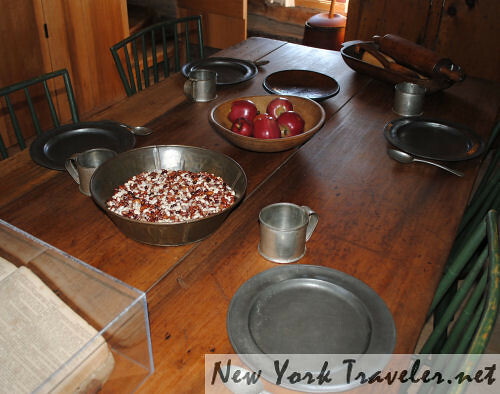 The Smith family was but an illustration of the deep religious divide taking place in America. While mainstream Christian denominations quarreled with and suspected one another, skepticism and radical departures from Biblical Christianity grew at an astonishing rate. This period in America’s history saw the quick rise of unitarianism, universalism, and a number of other similar religious “rationalist” movements. The Church of the Jehovah’s Witnesses (formerly known as “Bible Students”) and Seventh-Day Adventists also find their origin in this point in time. 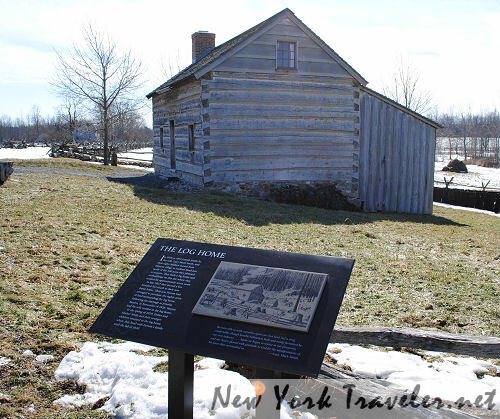 When the Smith family moved to this farm in Palmyra, New York, — a time when spiritual fervor was on the rise with the advent of the Second Great Awakening — the religious controversy that divided the family and the American people, was about to reach its climax in Joseph Smith. Smith later claimed that an angel named Moroni appeared to him in 1823, had him transcribe and then bury some golden plates (which have never been recovered) and start up a new church, the Mormon Church, named after the Book of Mormon. Smith’s new “church” was extremely controversial and contained a blend of the Christian doctrines and folk magic with which he grew up. He attempted to convert some of the local people, but was driven out of various towns for “corrupting public morals” with his practices of divination (deciphering pebbles in a hat) and polygamy (which was a very common mark of the other wayward religions that sprang up during this time period, such as another polygamous mystery religious community, the Oneida Community founded by John Humphrey Noyes). The polygamy charge is uncertain, as both Smith and his wife Emma denied any polygamous relationships, but some records show that Smith had married four other women. After Smith’s death, Mormon leaders incorporated polygamy as a Mormon doctrine until 1890, when it was repealed under pressure by the U.S. Congress. Smith and his followers fled to Ohio and continued westward. Smith died in Indiana while in jail for treason. 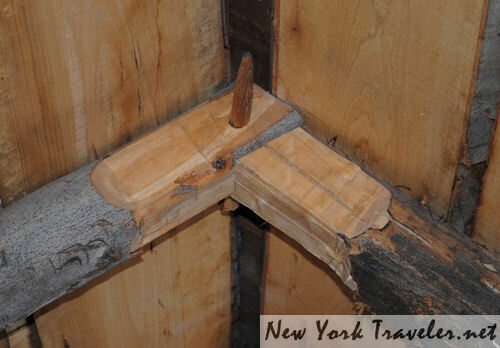 Near the log cabin is a very large building– a “temple.” The place was totally devoid of any people. The wind blew fiercely and the place was very creepy. 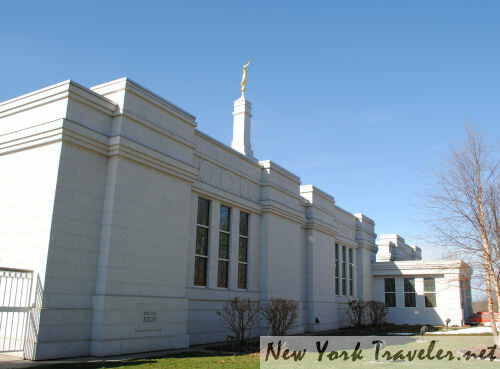 I snapped my photos, said thank you to the ladies, and we left for the Hill Cumorah site. 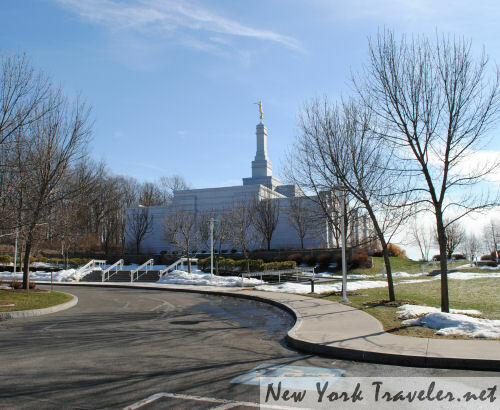 I’d visited Hill Cumorah when I was about 13 years old. We attended the Easter pageant there. My parents were seeking God, and considered joining the Mormon Church at that time. I’ll have more on that story to come.